If you’ve always wanted to use the Kanji alive web app as a regular desktop application on your Mac, perhaps because you preferred to launch it from your Dock or because you were just tired of juggling so many tabs in your web browser, you’re in luck! Fluid is a free application for OS X which turns any web app or website into a normal OS X desktop application. To create a Fluid app for Kanji alive, goto the Fluid website and click on the “Free Download” icon to download Fluid. 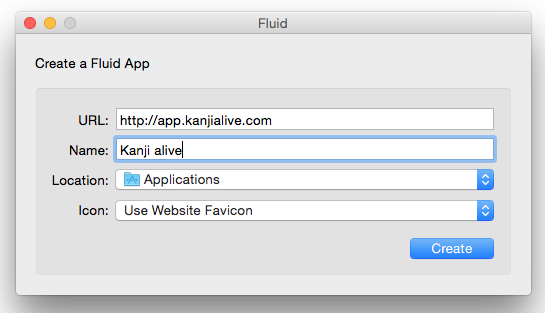 After you’ve downloaded and unzipped Fluid, launch the app and enter web address for the Kanji alive web app (http://app.kanjialive.com) and a name for your app into the opening screen (see below). Then click “Create”. Launching and quitting your new Kanji alive application will now work the same as any other OS X desktop application. In addition, you can resize the app’s window and adjust its position, size and magnification to suit your needs. The next time you open the app these settings will be remembered. However, you’ll have noticed that your new app does not yet have a nice icon! To fix this, simply create your own icon image. There are many ways to accomplish this but to get you started, we’ve prepared an image you can use based on the Kanji alive logo (please do not re-use this image for any other purpose). First download the logo.icns.zip file and unzip it. Next, select your new app in the Finder, goto the File menu and select “Get Info” (or just type command-I). In the top left of the Info window which will open you’ll see a circle with representation of the app’s icon. Drag the “logo.icns” file onto this circle. And that’s it! What about future updates to Kanji alive? There’s no need to worry about catching up with updates. Since a desktop app created with Fluid is really just a mini-version of Safari dedicated to a single web app, its contents will always reflect the current version of the original web app. Whenever we update http://app.kanjialive.com, the Kanji alive desktop application on your computer will automatically reflect these changes as well. We don’t yet offer Kanji alive as a desktop application for Windows but if you know how this could be achieved in a similar manner on Windows please let us know in the comments. This entry was posted in Feature, News on November 19, 2013 by Arno Bosse. [Update: This post was originally written in 2013 and several of the identified problems and suggested solutions are no longer applicable today]. This entry was posted in Feature, News on April 10, 2013 by Arno Bosse.